Designed for forced air cooling systems in cabinets housing electronic equipment, the P56 is an excellent choice where pressure drop is a concern. Multiple layers of crimped wire screen cloth arranged together to break up the air stream into small currents to impinge airborne dirt or entrained liquids on the adhesive coated wire baffles. Panels are available in P56A all aluminum construction or P56 all steel construction. Protective finishes for the P56 style are electro galvanized or cadmium plated, or chemical conversion* coat and anodize** for the aluminum style. 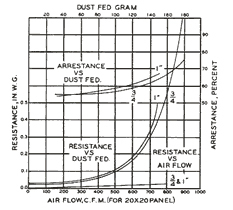 Average dust arresting efficiency is 60% using standardized dust and testing methods, Resistance is .01” H 2O @178 fpm to .03” H 2O at 356 fpm. Wide ranges of standard-size P56 filters are available. 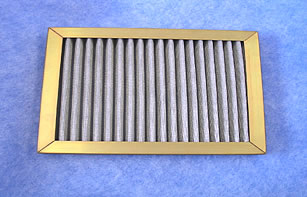 Filter thicknesses range from ½” to 1”. The P56 can be cleaned in water and detergent solution or a suitable Solvent. When dry, apply an even coat of adhesive. May be service as often as necessary without impairing efficiency.The P56 can be cleaned in water and detergent solution or a suitable Solvent. When dry, apply an even coat of adhesive. May be service as often as necessary without impairing efficiency.